I wrote in a previous post about the first pipe organ I built where I combined old organ pipes with new. The art and science of creating a certain sound from a pipe organ is referred to as tonal design, and it can really be both art and science. Building that first organ was in a way almost easier than building a clean-sheet design because I had a place to start and a place to finish. The organ that I am building now has neither a place to start nor finish, and I'm not sure which direction I want the design to take yet. 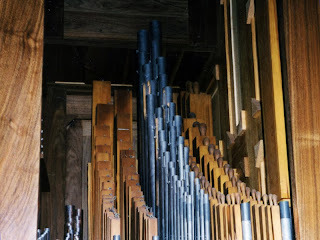 The old pipes that were made available to me provided the first organ I built with a place to start. Their dimensions determined to a large extent the dimensions of the additional pipes that I added to determine the overall core sound of the organ. This core sound is referred to by German builders as the plenum. The term most often used for the organ plenum in this country is chorus. 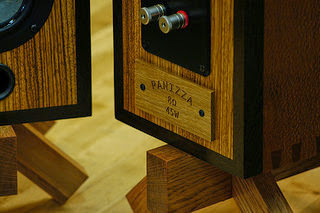 Those same German builders refer to how well the pipes combine to form a unique sound as the unity of the plenum tone. There are different ways to accomplish the tonal design of an organ plenum by selecting proper pipe dimensions - or pipe scales - of each set of pipes that form that plenum. Some methods rely on experience and subjectivity. Some are purely mathematical, and base the production of sound coming from an organ pipe on energy principles and fluid dynamics. I decided not to pursue that direction even though my engineering degree would have served it well. My background in music led me to rely more on art than science when designing the tonal result of a pipe organ. The design of my first pipe organ as an independent builder had a starting point in the old sets of pipes I used in its construction. It also had a place to finish. The instrument would end up in a particular church building that had certain acoustic properties. The acoustic properties of that building also determined dimensions for the new pipe sets I added to complete the idea of a plenum within the tonal design of that organ. I had to make sure though that new and old organ pipes not specifically intended to be used for solo sounds be carefully unified. The old masters knew well how to do this. I used a graphing method to represent the relationship of an individual organ pipe scale to a reference scale, and by plotting all pipe scales of the organ on the same graph in reference to that standard reference, I could predict how those pipe scales combined to form a plenum tone. 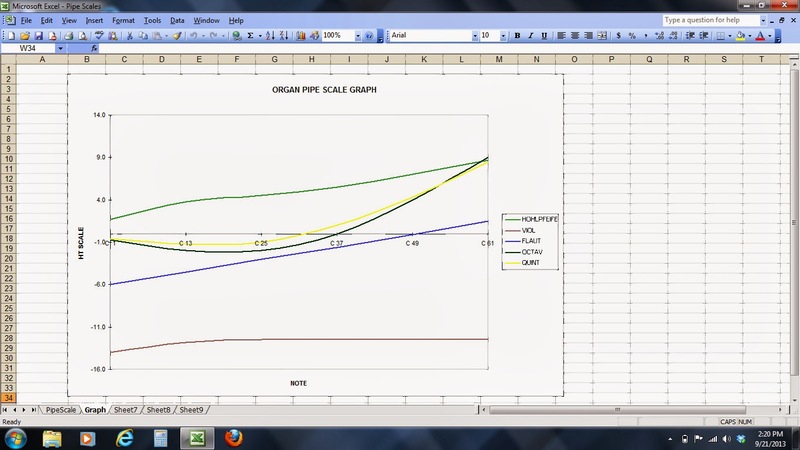 The graph shown here is the combined scale graph of the first organ. Its plenum tone turned out well. This I can demonstrate here by the recording of a Christmas carol made on this instrument with its plenum or chorus stops drawn. 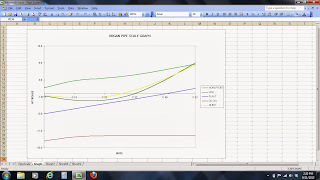 Something interesting the graph shows is that the data curves for what are considered the principal pipes - or those that make up the core sound of the plenum - are not straight lines but are concave. These are the curves for the Octav 2' and Quint 1 1/3'. This particular scale chart trend is evident in Baroque organs built in southern Europe, especially southern Germany, France and Italy, where builders used scaling practices that produced a particular tone color providing something just enough different and special to me. As I consider building another organ now, I need to determine what its plenum sound will be without having a predetermined place to start, or without knowing where it will ultimately go. I do know however how to design a unified plenum, and how important this is to the ultimate success of the instrument. One final thought. 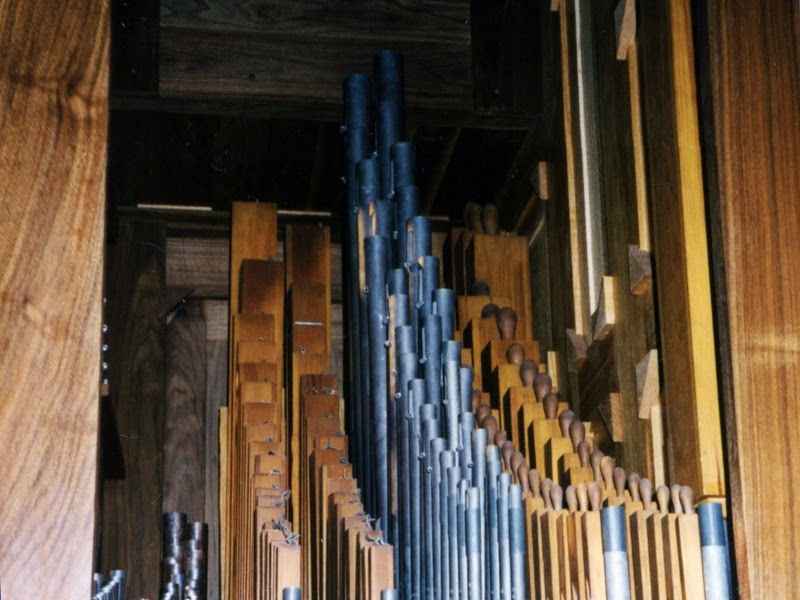 This post is not intended to be anything close to a comprehensive discussion of pipe organ scaling practices or tonal design, and a good builder or student of the pipe organ will realize this. There is much more involved than what is presented here. This post is a simple discussion of a method I used to create a tonal design, where certain conditions provided some initial direction to that design, so that someone reading this post can gain an appreciation of the process I will go through to create one more new tonal design. There are many other methods used to achieve a tonal result, and one thing that I was taught is that no one method is correct or incorrect if used properly to obtain a good outcome. Each new organ built is an expression of the artistry of its builder. I simply use what works best for me.